While a last will and testament is executed during a person’s lifetime, the will does not become effective until the person’s death in North Carolina. Oftentimes, a will maker may change his or her mind as to whom he or she wants to leave his or her property. This change in mindset may because of a life altering event, such as marriage, the birth of a child, or divorce, or because of a new relationship with a person not previously mentioned in the will, or even because of a deteriorating relationship with a person who is to take under the will. If a will maker does change his or her mind after executing a will, the will maker can revoke it, so long as he or she still has the testamentary capacity to do so. North Carolina General Statute (G.S.) 31-5.1 details the three methods by which a valid will may be revoked. They include revocation by (i) a subsequent writing, (ii) a physical act, (iii) or operation of the law. North Carolina G.S. 31-5.1 permits a will maker to revoke his or her will by executing a later written instrument. Unlike some states, North Carolina allows an entire will, or just a portion of the will, to be revoked. This revocation may be in the form of a subsequently written will, a codicil, or any other writing expressly declaring the will maker’s intent to revoke the will. However, the subsequent written instrument must be executed under the same formalities as are required for the execution of a will. It is also worth noting that a nuncupative will, also known as an oral will, cannot revoke an attested will (formal written will) or holographic will (handwritten will) because the nuncupative will is not a writing. Even so, a nuncupative will may revoke a later executed nuncupative will, or by a subsequent writing as described above. The will maker himself must perform the act, or if another person performs the act, it must be done in the will maker’s presence and at his or her direction. There are certain life events that commonly happen in a person’s life that may impact his or her last will and testament. People oftentimes have misconceptions about how the occurrence of these life events, whether it be marriage, birth of a child, or divorce, effects a will that was in place prior to the life event happening. The North Carolina General Statutes set forth how a will should be treated in various instances, some of which are discussed below. If a person executes a valid will in North Carolina and then later gets married, the will is not revoked by the subsequent marriage of the will maker. If the will maker later dies with the will still being a valid will, his or her surviving spouse will be entitled to petition the court for an elective share of the estate even though he or she is not mentioned in the will that was executed prior to the marriage. The will maker made provision for the child that takes effect upon the death of the will maker, whether adequate or not. A divorce or annulment that occurs after the execution of a will in North Carolina does not revoke the will. However, the divorce or annulment does revoke all provisions in the will in favor of the spouse from whom the will maker was divorced, unless otherwise specifically provided in the will. 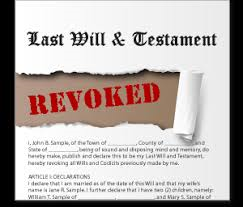 The general rule in North Carolina is that once a will is revoked it is considered to be legally dead and cannot be revived. However, the North Carolina G.S. layout four exceptions for revival of a revoked will. Re-executing the revoked will with the required testamentary formalities. Executing a new will in which the revoked will is incorporated by reference. Under the doctrine of republication by codicil, execution of a codicil that makes express reference to the revoked will. Where provisions of a will are revoked because of divorce or annulment, those provisions are revived by the will maker’s remarriage to the former spouse. If you do not have a will, or if you have a will that no longer expresses your current wishes, contact our North Carolina will drafting attorneys online, or by phone at 980-207-3355, to discuss the best course of action for you. Do not wait until it is too late. Doing so could have unintended consequences regarding how your estate is distributed upon your passing.